# keepalive: how long between heartbeats? # warntime: how long before issuing "late heartbeat" warning? # What UDP port to use for bcast/ucast communication? # crm configure property expected-quorum-votes="2"
4.- To have quorum, more than half of the total number of cluster nodes need to be online (number of nodes / 2)+1. Is not the case when a node failure occurs in a 2-node cluster. It works as Active/Passive perfectly! 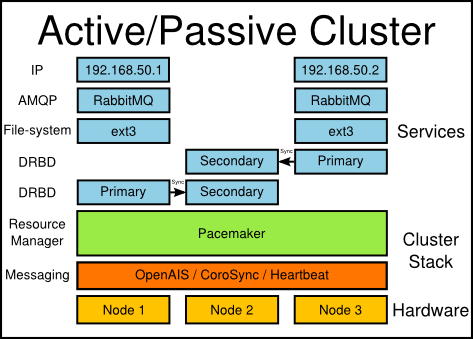 I am wondering, how to configure the Apache as Active/Active while the VIP maintain as Active/Passive? I think that colocation already handles the order of the resources, so no need to add an order constraint.